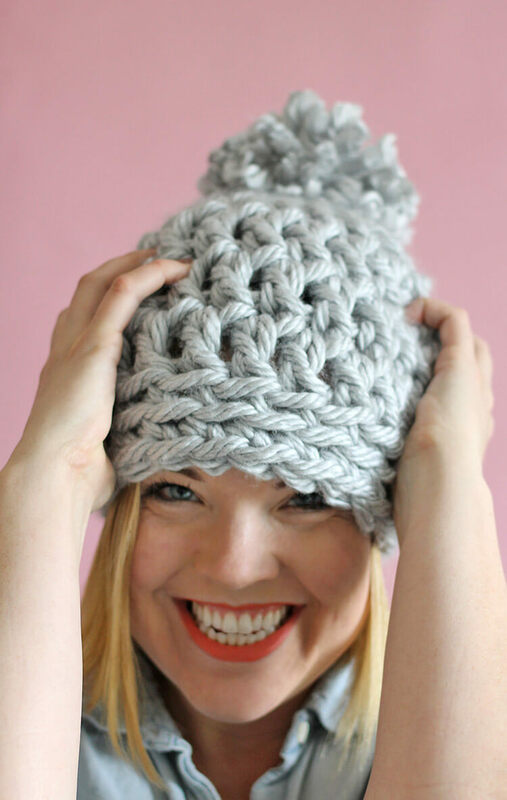 This easy chunky crochet beanie works up in just 30 minutes! 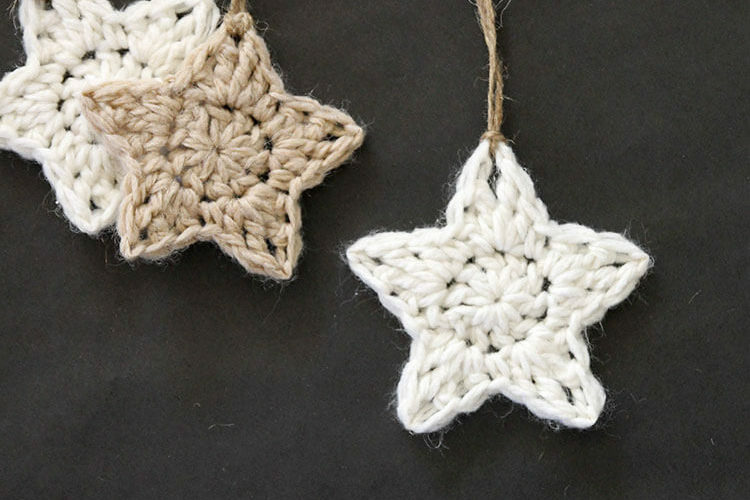 This free pattern will have you making gifts for friends and family in no time. This post contains affiliate links, which help to support this blog. Thanks for supporting Persia Lou! 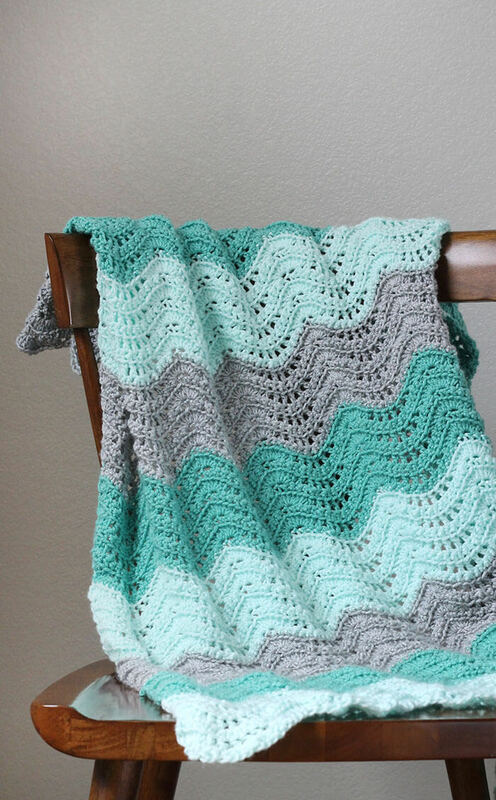 You guys – you all know I love to crochet, but crochet projects usually just take. so. long. Sometimes I just want to sit down and make something quickly! Know what I mean? 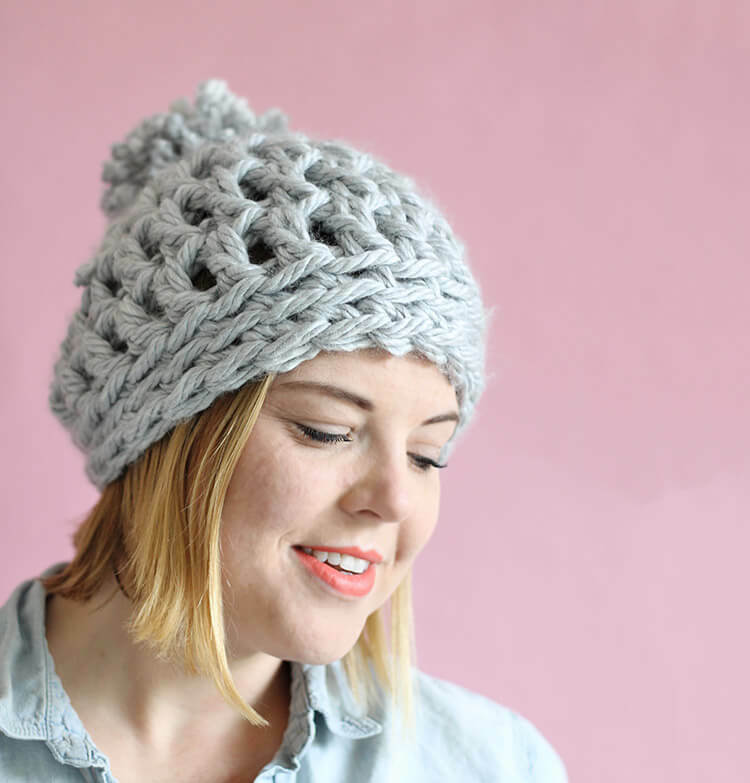 This easy chunky crochet beanie is the answer! I set out to create a pattern that could be completed in less than thirty minutes, and I did it with this fun hat. And – really – it is possible to completely create this hat in 30 minutes. I know this because I timed myself. ? I mean, everyone crochets at different speeds, so it’s possible that it may take you a bit longer than 30 minutes, but I just want to assure you it can be done! Super chunky yarn and a ridiculously huge hook are what make this hat go so quickly. Guys. It only has seven rounds. Seven. The whole hat! Kind of crazy, right? But also kind of perfect, especially for last minute holiday gifts! 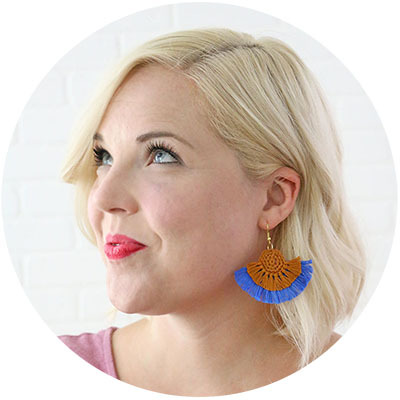 Ready to make some super easy, super quick hats? Let’s do this! Please note: This pattern is free for personal use. You may sell items you make using my patterns, but please use a link when possible. You may not sell or redistribute my pattern. If you would like to share the pattern with a friend, please send them the link. Pageviews help to support this blog and allow me to provide free patterns like this one. Thank you! ? Note on Hook Size: I used a S (19.00 mm) hook for the hat pictured, and it is designed to be a bit oversized. It fits on the brim fairly snugly, but the style is a bit loose and slouchy. For a tighter, less slouchy fit, use a Q (16.00 mm) hook. Round 1: Starting with a magic loop, work a ch 3 (counts as first dc) and 11 dcs in magic loop. Pull end to tighten loop, and slip stitch to 3rd ch of starting ch 3 to join (12 dcs). Round 2: Ch 3 (counts as first dc), dc in same st, 2 dc in each st around, slip st to join (24 dcs). Rounds 3 – 5: Ch 3 (counts as first dc), dc in each st around, slip st to join (24 dcs). Rounds 6-7: Work in back loops only, ch 1, sc in same st, sc in each st around, slip st to join (24 scs). Finish off. Weave in ends. To finish off you hat, make a large fluffy pom pom. I used one of the fun animal pom pom makers I picked up at Target, but you can also just use your fingers if you don’t have a pom pom maker. 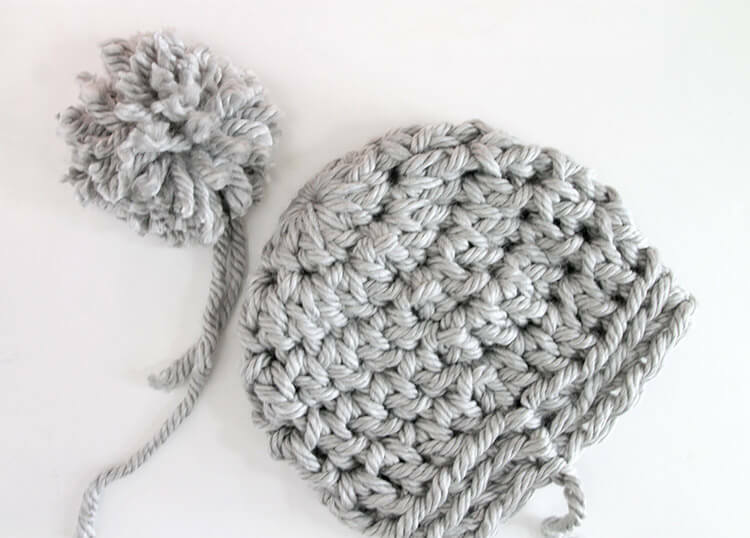 Trim your pom pom down to give it a nice round shape, but leave two long tails to help you attach it to the hat. Use the long tails to tie the pom pom to the top of the hat, and then weave in the tails with your hook (this yarn is a bit too thick for a yarn needle) and trim off the excess. And that’s it! Your hat is already to wear or gift! 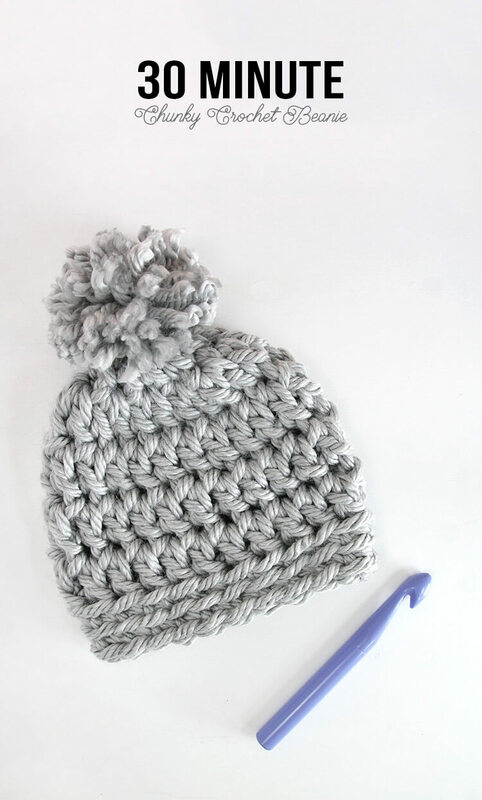 If you give this easy chunky crochet beanie a try, I would love to see how it turns out! Share photos of your work to my facebook page or tag me on instagram or twitter (@persialou), and don’t forget to use the hashtag #persialou for a chance to be featured. Thank you so much. Love it. I’m going to try to make a few for granddaughters for Christmas. 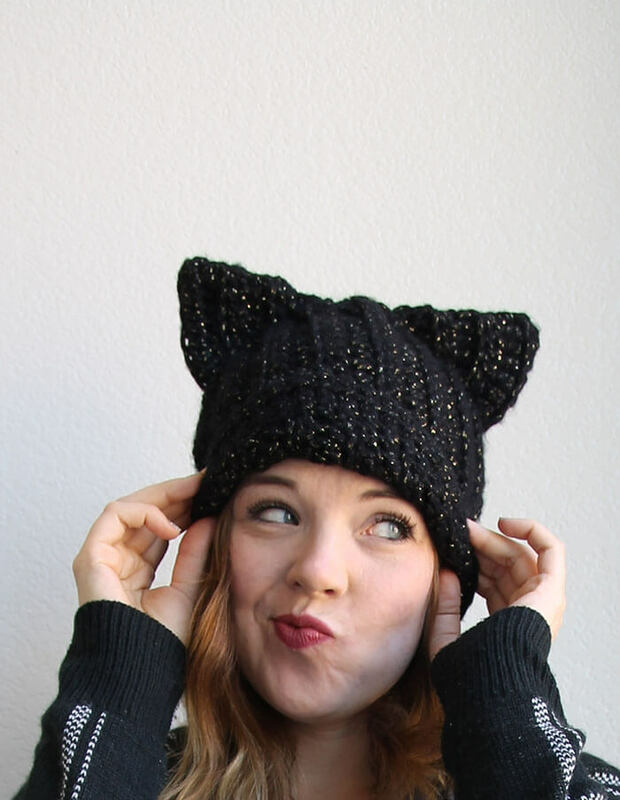 I love this hat and can’t wait to crochet it for Christmas gifts! Thanks for sharing. You are so welcome! Thanks, Cindy! This was the perfect gift I was looking for, thanks! It was so quick. But sadly I only have a Q hook, no S hooks for me?. Hi Hailey! Did you try it with the Q hook? How did it turn out? It worked well! I’ve made 2 hats and I’m on my way of making a 3. They are great gift ideas, thanks for the amazing pattern! Do you have a 4 T pattern? Love this look and looking for a new hobby to fill a bit of time. It has been a LONG time since I have crocheted anything. Any chance you could do a short video of the first two rounds as a refresher? Or do you have any recommendations as to sites I could visit to refresh my memory? Love this pattern. I only had a 10 mm hook so I just went with it. I knew the hat would come out too small for me so i made it for my 7 year old!! I did add a few extra rows…then I added long ear flaps on both sides. Turned out great and cute! she loves it. What is a magic loop? 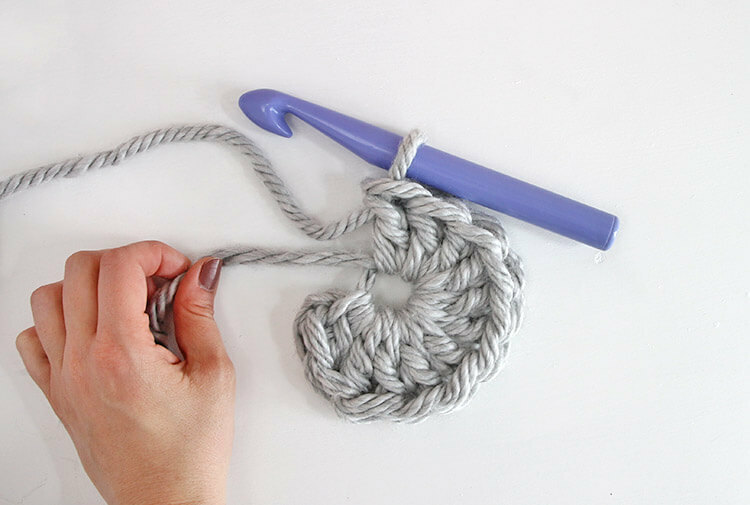 What is the approximate size of the crochet hook…love the pattern….so cute and trendy!! 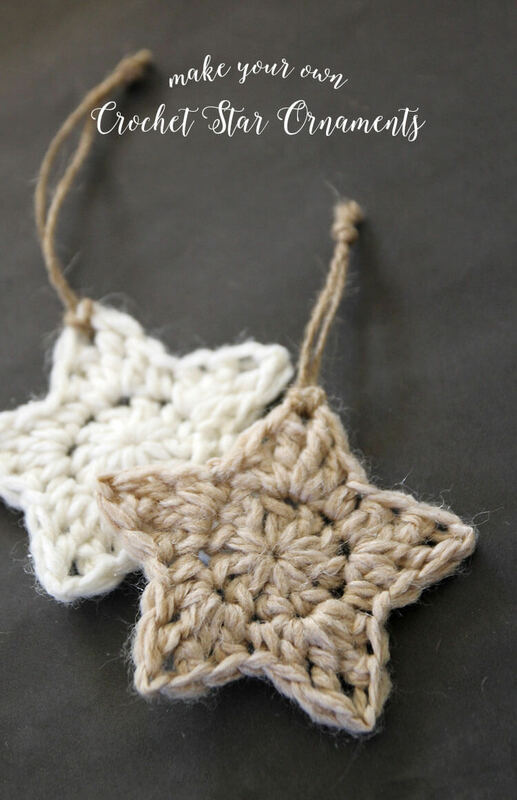 Would love to try this but think I need a video, it’s been awhile since I crochet anything. Hi Linda, I hope to have a video out soon! Haha I am with you on the just wanting to crochet and ignore everything else! The hat is a bit oversized, so I don’t *think* using a Q hook will affect things too much. Since it’s such a quick project, I would just recommend giving it a try with the Q and see how it works out for you. I have a feeling it will work just fine. Good luck! Hi DiEtta! I just made one with a Q hook to test it and it works just fine. It takes it from an oversized slouchy beanie to a beanie with a more traditional fit, so you may even prefer it with the Q hook. I updated the pattern to indicate that either hook will work. Thanks! Yes Yes Yes! But can we use a 15mm hook with the same pattern for adult? And I don’t have 7 bulky right now and I want to make this so bad, can I use 4 strands of weight 4? Oh YAY! I love that you did it in 30 minutes and that it turned out well! So happy to hear that! Thanks for your lovely comment. It brought a smile to my face. I was wondering if you had a measurement on how big the circle is when you have done your increasing and start to crochet down at the same number of stitches? I want to adapt it to use with a different hook and slightly less bulky yarn (just because I am trying to make some gifts without any purchases) but I want to make sure they are big enough for adult size. Ok- in less than 24 houtrs, you have me “hooked” and I want to crochet more! I have tried your slouchy hat and your chunky beanie. You have been VERY helpful with your email replies. My next question, do you hAve any patterns for crocheted beanies for guys? Hi Cindy! Thanks so much for your sweet comment. 🙂 I don’t have any patterns for guys, and I really need to get some! I will put it on my list of things to work on. Thanks again. Can this pattern be sized for a two year old and a 5 year old? Hi Alexis I just completed this pattern using a P(11) hook and chunky yarn and it is perfect size for a child..the only alteration to the pattern was I added a few more rows of the dc. worked perfect! Perfect! Thanks so much for letting us know how it worked out! Thank you for the video. I’m a visual person and it was super helpful. I used Lion Brand Hometown USA yarn and a P hook (11.5 mm). Because my hook was smaller I added and extra row of dc and sc. Mine wasn’t slouchy at all (just how I like it). Two sides ended up kind of boxy, more like a square pillbox hat than a beanie shape, and I’m not sure why. The other two sides are pretty perfectly rounded. I also ended up with some large-ish holes on the side that had 3 chains instead of a double-crochet stitch. Again, not sure why. Maybe just a beginner thing… Also, I didn’t have a pompom maker, so I just used my hand, and it made a rather large pompom, but that kind of adds to the charm, I think! Happy with how it came out, overall. It’s my first time crocheting, is there a slower video for starting and completing the second loop? I’ve got the first one no problem, the double loops are tripping me up for the second round. Hi Nikki! No I’m sorry I don’t have another video for it. 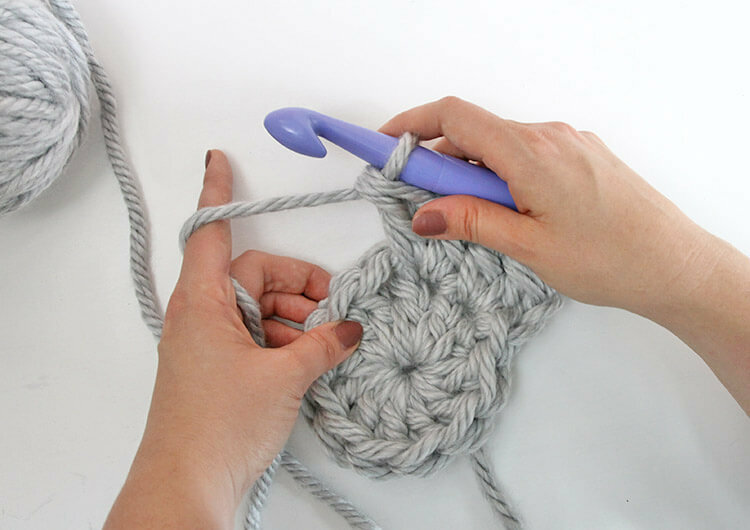 Are you having trouble with working double crochet stitches in general or with working two double crochet in each stitch or something else? The messy bun trick with the hair tie is genius! I would love to see a photo of that! Loved making this! Completed in about 45 minutes, only because I had to stop and answer a phone call! I’m going to make many more for my friends and family. I am not good at this! I am having a hard time understanding where I join with a slip stitch? Thank you for this pattern. I made one for my neighbor’s little girl and added a pink fur pom pom. I have a photo I’d be glad to share but not sure how to do that. Hi Allison! I love that you added a pink fur pom pom! If you use facebook or instagram, you can send me your photos there (facebook.com/persialou or instagram.com/persialou) or you can just email me at [email protected] Would love to see it! How would you modify this pattern for a kid or baby? I would love to make some for my nieces and nephews!! Thanks!! Where did you find the pompom maker? Made one and showed my friend. It took off like wide fire. She made 5 and I made 6. Thank you. Love, it. I made one today with a Q hook and Lion brand Wool Ease thick and quick yarn. It used less than the full 6 oz skein. Worked up quickly and fits great. Love it! Thank you. I want to make this hat, but the largest hook I have is an N. How would I make it fit using the N hook and super bulky 6 yarn? What a cute hat! It took me 75 minutes but I haven’t crocheted in years. Your directions – especially the video – made it so easy. Thank you? I did this with a “N” 9mm hook and started with a base of 15 dcs instead of 12 and added 2 rows before doing the scs and it turned out perfect for my 10 month old! Love Love Love this pattern and hat! I found this pin just days ago and I am already starting my third hat! (I have a serious crocheting addiction) I usually make blankets and hats and this is my first hat without a loom. Your tutorial rocks and is one of the best ones I have seen! So I would love to know how to make this for a toddler or small child. I would love for my little one to match me 🙂 Do you have any suggestions to making this smaller? Hi Amy! I’m so glad you like the pattern. I’ve been meaning to do a kids’ version, but I haven’t gotten around to it yet. I would try starting with maybe 8-10 stitches in the first round, and then follow the rest of the pattern. You will probably need to take off a round to make it shorter as well. Let me know how it turns out! Is it possible to make this pattern with size 6 super bulky cozy wool? I love this pattern! Just not sure my yarn is large enough and which needle to use. 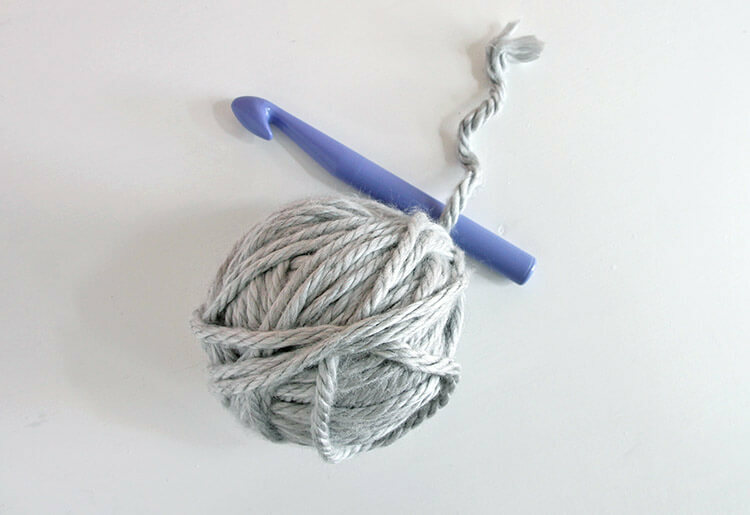 Crochet hook…not sure why I said needle ? I have made so many of these now. I absolutely love it! I love this pattern, but i am a beginner crocherter, i have an S hook, but its really difficult to use. Do you have a pattern for a P hook for an adult, im using size 6 yarn. Or do you have any advice when using a larger hook. I have made projects using a H and J hook, and didnt have alot of trouble. Hi Katie! 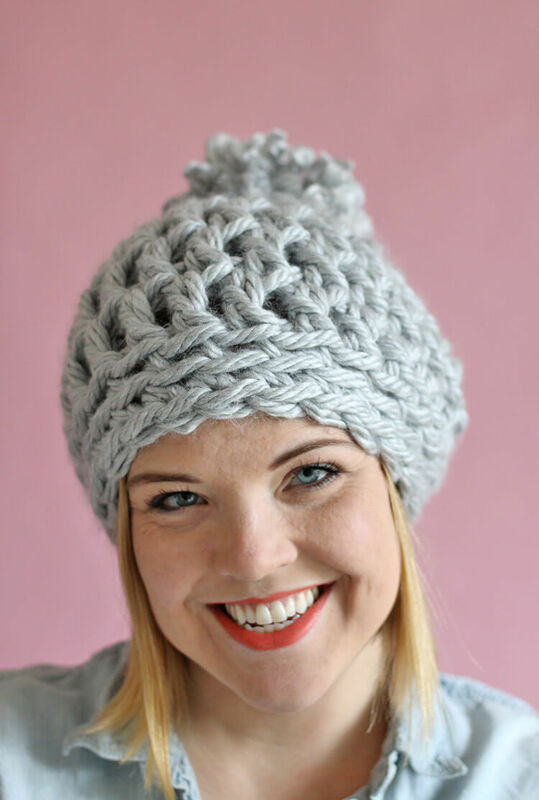 If you are looking for a hat pattern that uses a smaller hook, I have two that might work better for you – the simple slouch hat (http://persialou.com/2014/12/simple-slouch-crochet-hat-pattern.html) or the chunky ribbed slouch (http://persialou.com/2015/11/chunky-ribbed-slouch-hat-free-crochet-pattern.html). They will take a little longer than this pattern, but both are still good for beginners. Hope that helps! i really love your hats. I appreciate your tutorials and training. 🙂 Keep them coming. Thank you so much for sharing! My daughter is wearing the first hat I made. She had to go to bed before I finished my second which I’m keeping!? What a great pattern, Thank you! I absolutely Love crocheting this easy beanie! I’ve made at least half a dozen or more since finding it. What’s so great about your pattern is that it actually fits lol! So many I’ve tried either look like a barrel hat or way too slouchy. Thank you so much for sharing freely. Thanks so much, Alice! I’m so glad you like the pattern! How do I print your pattern(s) without printing all the ads and pictures. I love this 30 minute hat project, therefore, I know I will love all you do. I just finished making this real quick, and it was amazing. Thank you so much. The video was also extremely helpful. Now I’m going to make a few more, with different colours! Thanks again! I Love love love this hat pattern!!! I was hoping to duplicate it for a baby hat. Do you have a suggestion on how to do this? Thanks!! Hi Lauren! It might be tough for a baby hat because the yarn is so thick. But you could try eliminating one or two of the increase rounds (where you are adding stitches). Or you might want to check out this pattern (https://persialou.com/2013/07/simple-newborn-earflap-hat-free-crochet.html). That one is really for a teeny baby, but you could add a round or two of the increase rounds for a larger baby. Hope that helps! I made one with the Q hook and jumbo yarn and it turned out amazing! How could I make his hat with thinner yarn? I tried it and it came out lovely, I even made one for my boyfriend! I did it in about one hour because I’m not very fast! Excellent pattern! This pattern has been calling to me for a few weeks now and today I finally went to the store for both size hooks and some yarn! I decided to use the 15mm hook and it fits me exactly as I had hoped. Yay! So I immediately started a second one with hopes of making the last couple/few rows a second color like the one toward the beginning of your amazing video tutorial. I’ve pulled the second color out at least twice now getting to figure out how to get it to join correctly. Now that I got that done right, the second color looks too narrow… Like maybe I should have done the last row of dc with the second color also. How/Where did you start the second color for the bottom portion? Once I get that the way I want it, I’ll be making lots more for gifts and for myself! Hi Linda! The purple is color is Bernat Mega Bulky in Purple (http://amzn.to/2kqIokQ) and the black is Bernat Mega Bulky Sparkle in Heather Gray (http://amzn.to/2AUuga6), and that one is a little harder to find online. Hope that helps! My granddaughter asked me to make her a sloppy bun hat. I was looking for a pattern and found yours. I used a pony tail tie and a 9mm hook because I didn’t notice the 1 in front of the 19 lol. I had to make 7 rows of double crochet to get the needed length. I used the same 12 double crochet for my starting count. It turned out so cute. I also added a crochet bow and a blingy button. I am making 10 for all of my granddaughters and daughters Thank you so much. Oh I love that! Thanks so much for sharing with us! Hi. This is so amazing 🙂 Making it was super fast. Thanks a lott. 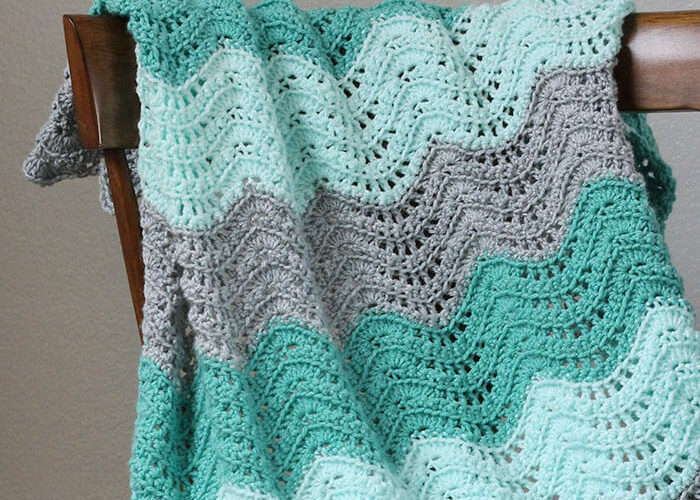 This is a great quick pattern. I have made 6 of them using super chunky that I didn’t know what to do with. Myself and 2 of my granddaughters went out and gave them to some local homeless people ( who were very grateful). I love love love this pattern. I have made several hats using same hook size and 3 strands of yarn. The color combinations are endless. I just finished making matching hats for a family. I’m almost finished with the hats. I am just missing the pom poms. My question for you is what size pom pom would you say they are? I went to Target to look for the pom pom makers and they didn’t have any, so I went to Hobby Lobby and used my coupon and bought a pom pom maker that has many sizes to choose from. Thanks in advance for your time. I know, I tried looking for them at Target. I got a pom pom/ tassel maker combo. I love it! I have been making different size hats by adjusting your pattern and then making pom poms to go with them. Thanks for your help!! I was wondering if you can make this on a peg round loom? If you could make a video using that instead of the hook? Thanks so much! Love this pattern! I’ve made for the birthday of the little girl I look after. Hope it fits and hope she likes it. I’ve used XXL 80% polyester and 20% acrylic yarn with a 15mm hook as I couldn’t get a bigger one. Hey Alexis!! This hat look awesome on you!! You did a great job and it looked so tempting to make I just has to run out to a LYS and get some of the same exact yarn and needle you are using. Unfortunately I am at my 2nd attempt because it is just tooo big for any head. I ran our of the yarn way before finishing which is an indication I am doing something wrong. I am sure my stitches are too lose. I am not normally a crocheter but an avid knitter. Either way I am def going to keep trying til I achieve it!! BTW, I absolutely LOVE your craft room!! Thanks for the pattern! This hat looks so cute! Do you think I could follow it with a much smaller hook for a baby hat? Has anyone tried that yet? I want to do a grey one with black rim and pom pom for a baby shower. I pinned this pattern probably years ago and just finally went and got a 19mm hook and the yarn to make this. I’m so excited to try it, it’s so cute! I really want to get back into crocheting and make some neat things. Thanks for the video tutorial as well, very simple and easy to understand, and helped to refresh my memory on a lot of the abbreviations. Thank you so much for sharing this! I have never been able to (aka: been too afraid to…) crochet anything that isn’t a square or rectangle (lots of scarves and blankets here!). This tutorial was just the thing I needed to get myself started in the world of hats and hopefully more. Your video and instructions are very easy to follow, clear, and also quite adorable. Thanks again, it was just what I needed to build the confidence to create more stuff! Looks great and easy. I’ll be making this today!